The city belongs to you: at the Ride Tour connected to the Deutschland. Deine Tour. and the Deutschland Tour you can take off on two wheels through the city. And it doesn’t matter what kind of bike and what your goal is. At the Ride we all go with each other, and not against each other. Whether you are a well-trained commuter, an unhurried city cyclist, a newcomer to the bike, an E-biker, a day tripper or you are underway with the whole family – at the finish of every stage of the pro race in each city, the Ride Tour , will be waiting near the finish line for you to take it on with your bike, so that you can experience relaxed urban mobility on two wheels. And you have your choice of bikes. Whether a racing bike, mountain bike, Holland bike, city bike, reclining bike or E-bike, bought as is or custom-made – everyone is welcome! Meeting up at the headquarter of our partner Lotto Rheinland-Pfalz: the participants of the Ride Tour and the pro riders. The Ride Tour differs from stage town to stage town - just like the Deutschland Tour. Find out how you have the chance to become part of the Deutschland Tour 2019 in your city - for free! The Ride Tour is especially aimed at the visitors who do not feel up to the Jedermann race but still like to cycle or would like to try cycling on an auto-free course. 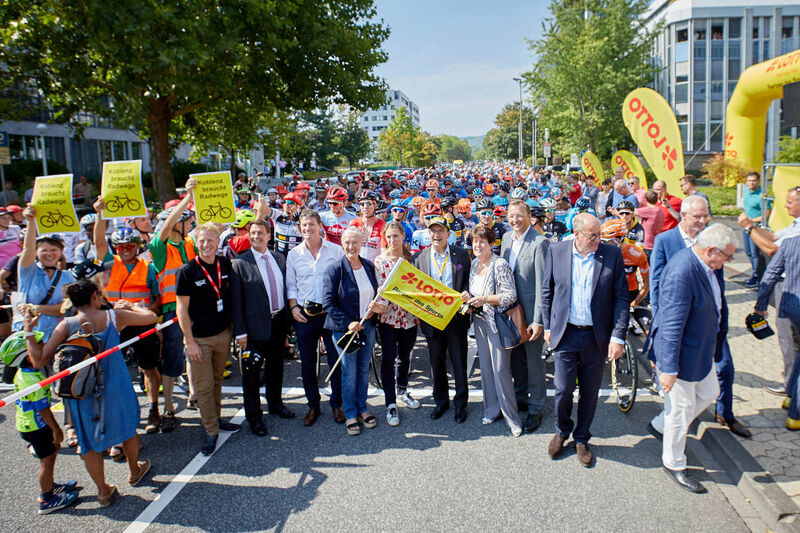 The Ride Tour will show how comfortable cycling in the city can be – and at the same time be a demonstration for traffic conditions in he city which are also good for cyclists. A highpoint of the Ride is crossing the official finish line of the pro race.